I spent the most fabulous day at the Craft & Quilt Fair in Darling Harbour. I walked in and have to admit that it was a little crazy. People, everywhere! There was so much to see, do, learn and buy. I opened my map of the venue and planned my morning. My first stop was at the Kelani Fabric stand. I’ve been drooling over the gorgeous fabric panels which Cat & Vee make. If you’ve not seen them, check out the #catandvee hashtag on Instagram. Super cute! I bought Millie Mischief (Mouse) and Finn McTrickster (Fox). I wandered the stands and bought bits and pieces from a few different stalls. This wall of Washi tape was amazing. It took a little while to get this picture – I had to wait for a gap in the enthusiastic shoppers. It was very popular. Imagine the fun you could have with one of each of these rolls. Honestly, there was so much to see and buy, I could have spent a fortune. This vintage child’s sewing machine caught my eye. Lovely, isn’t it? I can just imagine it sitting happily in my sewing room. But I tried to stay on budget by leaving all of the shopping and heading over to the quilts on display. There was so much beauty. So much creativity. So much inspiration. 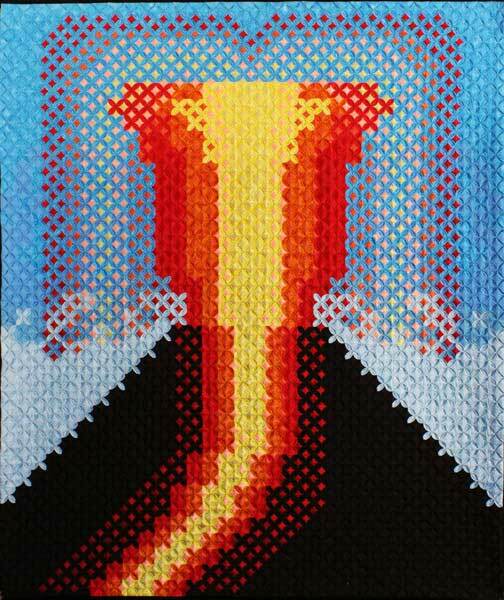 One quilt which particularly caught my eye was called Volcanic Eruption by Keiko Arita. It’s made up of cathedral windows. Lot’s and lot’s of cathedral windows. It’s stunning from afar, but even better up close. All of the prize winning quilts can be viewed HERE on the NSW Quilt Guild page. I got home and unpacked all of my goodies. I was very restrained, wasn’t I? I can’t wait to play with the Perfect Circles and the Millie Mischief Mouse panel. Oh who am I kidding. I can’t wait to play with all of it!! When was the last time you went to a craft or quilt fair? Did you blow your budget? Did you have a budget? Looks like you were very restrained! There was a quilt show in town a few months ago - much smaller than they've had in the past, but I definitely blew the budget. We don't pay as much for fabric in Canada as you do, but I'm jealou of American prices. Let me know how you go with the perfect circles, Ive had my eye it buying one for a while now...no show this year, have been a few years in a row. Next year a must. Love all your goodies! That washi wall has me drooling!!! I'm going in on Saturday - will be even more crowded I imagine! But that was the only day I could get babysitting AND go with mum. I don't think it would be much fun with a one-year-old! So many lovely things - I'm getting excited seeing everyone else's blog posts/photos etc. Enjoy your new acquisitions! You did extremely well! I spy some ground walnut shells - I need to find out where to get some as I am in need of a pincushion and would like to stuff it with them (is that what you are doing with yours?). What is the little yellow thing to the right of the Kate Spain fabric?